Please contact us initially to check availability and enquire about booking one of our tours. Mineral water, tea and coffee are complimentary on all our tours. On our scheduled trips wine is included with dinner, other drinks are extra and there is a reasonably priced bar for guests’ use. Bar bills can be settled in cash at the end of the trip. Gratuities on the boat. It is customary to tip the crew at the end of a tour. We recommend a minimum of 10 Euro per day per guest. If you’d like your very own expert-led trip, aboard a traditional gulet, see: Gulet Charters. Visas for Turkey are easily obtained online at eVisa and must be purchased before you travel. Guidelines laid down by the UK Department of Health say you do not require any specific inoculations for the locations covered by our tours. 2. Bank transfer. Please contact us and we’ll supply our bank details. 3. We accept payment by Credit Card for deposits only. Final Balances payments must be made by bank transfer. If you would like to pay your deposit by Credit card, please let us know and we will call to arrange payment. Many tour operators apply surcharges when exchange rates fluctuate or fuel prices or taxes increase. The price paid for our holidays is no longer subject to change. We will not pass on surcharges of any kind. Once we have confirmed your booking we guarantee the price of your trip won’t change. Click here for our Booking Conditions webpage. We feel certain that any trip that Michael and Paul were running would be excellent and would not hesitate to recommend them. Paul especially was so good in both his knowledge of the subject - and in the way he put it across, he had our rapt attention all the time and really brought it all to life. They really do know what they are talking about and how to bring it alive - and fun - for the visitor. Not just that, but they are great people to chat with too! 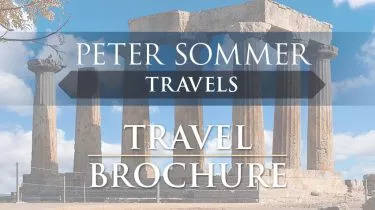 We would certainly recommend Peter Sommer Travels - and already have to friends who have made a provisional booking!